If you follow the WordPress economy via your RSS reader, favorite podcast application, and Twitter, then there’s a chance you develop a level of cynicism around the idea of another WordPress business starting up. By that, I mean that it seems like there’s something new every single week: It could be a plugin, a new service, a new site, a new theme, or whatever. And there is! I know that some like to talk all about the low barrier to entry that WordPress offers (which I call into question), and you may say that because of that, it gives people this sense of confidence that they can start a business built around WordPress and then find success. First, all of these things that we see so frequently are signs of a vibrant and healthy economy. Secondly, what’s wrong with so many people trying to start something new? Being completely honest, I love seeing the various things that people are building. I, like everyone else, know that some things are going to be more successful than others. That’s the nature of it, right? The market decides what it wants and all that jazz. One of the things, though, that’s a bummer is when I see someone start something new and then they completely abandon it to move onto something else. The project just sits and rots. And for some, that’s fine. Maybe it should die a slow death in a dark corner of the Internet. But what about those ideas that are good, that do solve a problem, and that really can make a difference in the lives of people using WordPress? Do we, as a community, have a habit of abandoning our projects too soon? 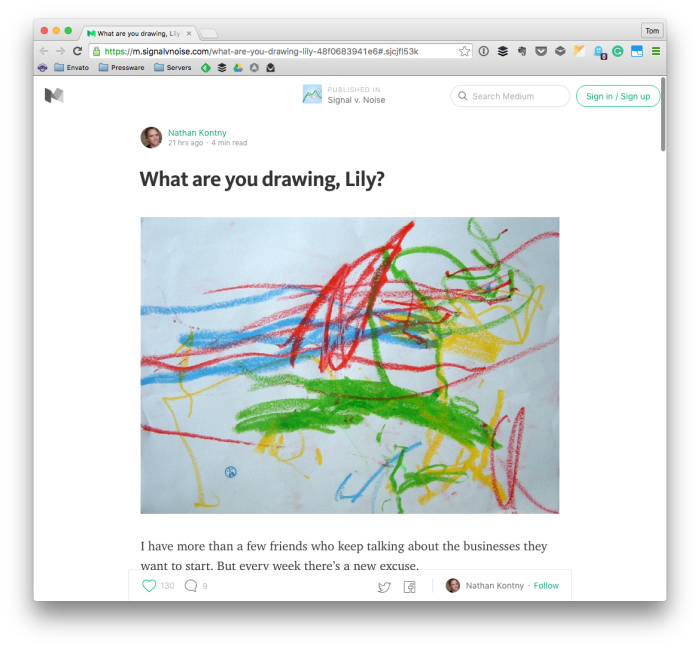 I recently read an article via Nathan Kontny, CEO of Highrise and one of my favorite bloggers from Basecamp, called What are You Drawing, Lily? and it tackles this idea. And he was right. Airbnb’s idea wasn’t just crazy, it wasn’t good — they wanted people to rent out real airbeds, and hosts were required to make breakfast for their guests. After 8 months in business, they were stuck making $200 a week in revenue. Whatever idea that you have that you’re trying to make happen is not going to generate a lot of money in a short amount of time. It’s going to take patience, it’s going to take iterations of work, and it’s going to take several course corrections. It’s easy to look at all of the work other people have done (or are doing) around us and think that we’re doing something wrong because we haven’t “made it” (however you define that is up to you). But building something and then abandoning it a few months later isn’t fair to the product or yourself. Give your idea a chance. Let other people use it. Continue to market it in whatever way you think is best. Sure, eventually the market is going to decide if they need it or not, but don’t let the fact that something you’ve worked on for a month or so die just because you’re not making any revenue off of it for the first few months (or even year!). If you really love the platform, and you’re completely into the idea of what you’re creating, doesn’t it deserve all the energy and work you can muster to make it the absolute best you can? They say it takes at least two years to even make a dent with your business. History has been written by people who were too stupid or too stubborn to quit. There’s a lesson here. Work your business idea for longer than you think it should. Don’t quit at the first sign of trouble. (Seth Godin called this The Dip). Too many good business models are abandoned because it didn’t come easy. The best things never are easy. Many of the most successful people I know started working on their businesses later in life than where I am and they’ve been, by all definitions, successful, but they have no signs of slowing down and now that they are “there” they certainly aren’t coasting. I’m not sure the low barrier to entry for WordZPress has as much to do with anything as the low barrier to entry to setting up what people want to call a business on the internet. Which, done correctly, isn’t low. Building something basic with WordPress isn’t all that hard, and making cool stuff with it isn’t too tough for most people interested in development, WordPress, design, or whatever. But creating, getting off the ground, and operating a successful business is something else entirely. It looks deceptively easy, which the purveyors of “business in a box” type websites and tools try to make sound realistic. But ask anyone that’s built a sustainable, profitable business online, or selling SAAS or whatever, and they’ll usually tell you differently. Forecasting, generating adequate cash flow for taxes, and even time management usually become realities that weren’t looked at carefully. So people give it a shot, see it’s not as simple as it looks, and move on. The internet is littered with the bones of some good ideas, but poorly implemented businesses. Building something basic with WordPress isn’t all that hard, and making cool stuff with it isn’t too tough for most people interested in development, WordPress, design, or whatever. Agreed and even more so to the point of when someone has a technical background — there are tried and true principles that make it possible to build a solution in nearly any given language once you learn the language and environment, of course. But when it comes to the act of actual business, that’s a whole other thing. I’m headed into my 7th year of this and there are plenty of things that I’m still learning. Thankfully, I have people around me who have done this before, and I’ve learned earlier rather than later to defer to people like CPAs to handle some of the other stuff. This doesn’t mean I don’t want to understand it. On the contrary. But I’d rather have an expert handling it so I don’t have to worry as much about it and I can actually work on the stuff. One of the great sayings that I always try to remember is about how many people quit when they’re on the 99 yard line, and didn’t even realize it. Carry the ball the whole way, or someone else will be happy to pick it up and run it in for you. someone else will be happy to pick it up and run it in for you. This is also why I think it can be tough to go alone through just about any venture. Yes, one person can do all the work, but when you break down everything that has to be done into manageable units of work and you see just how much really has to be done, it’s hard not to have at least one other person working with you. I was recently reminded that no one would expect someone to be a successful gymnast straight away or to make a brilliant wooden table when they had never picked up a tool before, yet when it comes to business ideas, we seem to expect instant success and then give up as soon as it doesn’t come. Which is why it’s important to keep developing an idea till it comes through, but that’s hard work when all these sites online talk about “get [business/rich/success/something] quick”. P.s. have you seen the marshmallow challenge TED talk? I think it relates. yet when it comes to business ideas, we seem to expect instant success and then give up as soon as it doesn’t come. Personally, I think this is the nature of the Internet and what certain news sites, Twitter, and generally Silicon Valley has brought us. And I’m not talking about the large companies that are out west, but just generally people who are writing and sharing about what they are doing when there’s yet something to show for it. Nonetheless, you’re right — no one excepts most to be amazing guitarist without a few years of putting in the sweat equity. I’ve not, though I suppose I should :). I’ve got a full list of things to do in ‘Things’ for the next two weeks but I’ll make a note to check this out as soon as I have a chance. After “seems like a basic feature” I think you’ll like the talk. It’s about 6 minutes long. And I agree, the social media culture doesn’t help. Noted! I’ll throw this into my “Must Watch” list :).